The internet has been a great invention, this I can't deny but sometimes I think the online world has taken over. Everything seems to be digitally done. Cards have become e-cards, less 'real' books bought, I mean I love my kindle but nothing beats the smell of a good book or is that just me? And then there's the lost art of letter writing. Emails are so quick to type and instant to receive that putting pen to paper seems to be a rare thing these days. I love following The Reading Residence and her idea of bringing back paper. More people should follow this concept, I mean even just writing out a simple list instead of popping a memo on your phone!! I recently bought myself a lovely letter writing set from paperchase with the promise to myself that I would start writing more letters, especially to my nana who I get to see so rarely because of not living close by. Getting a letter that isn't a bill definitely puts a smile on my face. And I love picking out different stationery to use. So much more personal, you get to put your personality into it, seeing someones handwriting rather than a genric font on a screen. I know my family appreciate the letters, little updates to keep them informed. And it is something I want to encourage my girls to do too. The last letter I sent to my nana included cards and thank you notes from my daughter's. I've set myself a goal to try and send atleast one letter a month. And the good thing about all the letter writing is that it gives me an excuse to go out and buy more pretty stationery, a girl can never have too many pens!! Do any of you still write letters or is it something you'd consider taking up?? I love writing letters - used to do it all the time in my university days as most of my friends didn't have email back then and social media didn't exist. 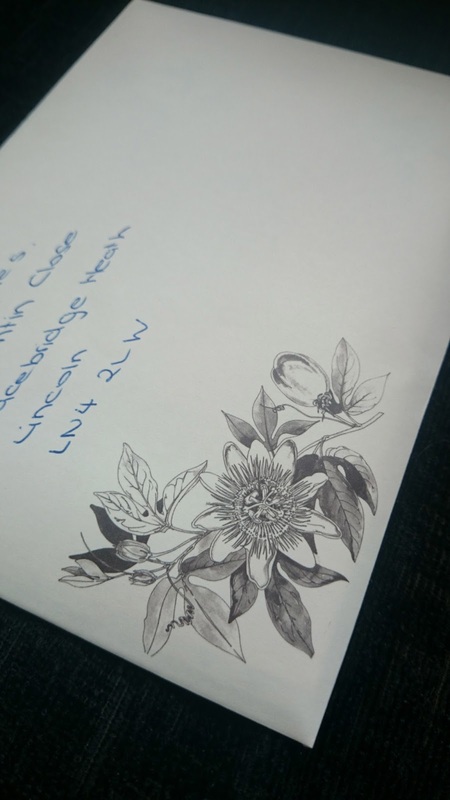 These days it is much rarer for me to write a proper letter but like you, I try to send at least one a month and cards are always proper cards rather than e-cards. It is so lovely to get a letter in the post isn't it? I used to write long rambling letters to a range of people, but mainly because I got into the habit from writing to my grandparents, or rather from my Granny writing long rambling and frequent letters to me, to which I, of course, had to reply. And then it snowballed. Now I blog instead. So much more efficient. And my witty descriptions of life, the universe and everything are now preserved for posterity! Not sure I'll go back to the letter writing, but I ought to send at least a Christmas catch up and more thank you notes though. I really want to write letters but I have no one to write letters to. :-( And what a gorgeous writing set; I have that set as an address/birthday book.